How could you NOT want to dine in a restaurant called a “Caveteria”? It was a cafeteria in the basement — the cave — of the swanky Baker Hotel, and it looks like it was a nice cheap place to grab a quick lunch downtown in the 1920s and 1930s. A year later the price was holding at 25 cents and it seems like a pretty good deal. “The Original ‘Caveteria'” — accept no imitations! 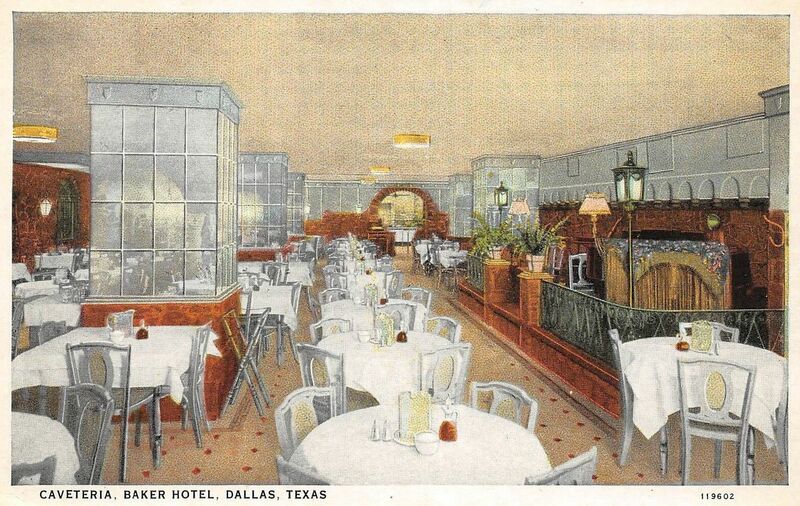 At least one other hotel in the Baker chain — the Gunter, in San Antonio — had a “Caveteria,” but apparently Dallas’ was first. In fact, the word and the hotel made their way into H. L. Mencken’s The American Language, Supplement One (see here). Oh yeah — live bands played while you ate your hearty meal of minced beef tenderloin. Even Lawrence Welk settled in for a stint as the “musical entree” in 1934. And there it is — another place I wish I’d been able to visit. Color postcard found on eBay. The Baker Hotel opened in 1925 at Commerce & Akard on the site where the Oriental Hotel had previously stood, catty-corner from the Adolphus. There was a piano in it as well. I never went there but have a post card with a pic of it. Fascinating. Thanks for posting all of this.